In the 1950s, during the height of the anti-communist hysteria led by Wisconsin Republican Sen. Joseph McCarthy, thousands of people, from shop workers to Hollywood figures, became victims during the Cold War’s initial years. Hundreds were hunted down by the FBI, deported or wrongfully imprisoned, including Ethel and Julius Rosenberg. Then on June 19, 1953, the Rosenbergs, now remembered as heroes for democracy and peace, were shamefully executed for allegedly giving the Soviet Union the “secret” of the atom bomb. Their son, Robert Meeropol, now 60 and the father of two grown daughters, says his work today is largely based on his experiences as a child. In 1990, Meeropol founded the Rosenberg Fund for Children (RFC), a public foundation providing for the educational and emotional needs of U.S. children whose parents have been targeted for their political activities. Over the years, the RFC has made grants of over $3.5 million to benefit hundreds of children. This June 19, the RFC will commemorate the 54th anniversary of the Rosenbergs’ execution with “Celebrate the Children of Resistance,” a program of dramatic readings, music and poetry. The event will take place at the John Hancock Hall at the Back Bay Events Center in Boston. Angela Davis, Eve Ensler, David Strathairn, Howard Zinn and many other notable figures will be featured. “What we are trying to do with this program is to celebrate the heroic resistance of my parents,” Meeropol said in a phone interview. Today, Meeropol believes RFC recipients and their families are doing just that. Speaking at the event will be Iraq war resister Camilo Mejia, 31, who served in the U.S. military for nearly nine years, including five months in Iraq in 2003, before refusing to return. Mejia, the first known Iraq veteran to refuse combat, applied for conscientious objector status in 2004. Instead he was convicted of desertion and sentenced to one year in prison. He was released after serving nine months. Mejia’s 6-year-old daughter Samantha is an RFC recipient. “We’re not living in a democracy; profit is the top U.S. priority and we can never separate the corporations from our struggles,” he added. Meeropol emphasized that the main message of the RFC and the event is to highlight the child’s point of view. 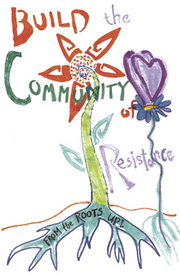 “We want to take the needs of children into account, not as do-good softies, but we believe this is the way to invest in the continuity of struggle across generations and to embrace the progressive and activist community,” said Meeropol. For more information, call (413) 529-0063 or visit . Pepe Lozano (plozano @pww.org), a PWW staff writer and editorial board member, is an RFC beneficiary.